The Challenge Cup has been postponed, due to torrential rains on Friday. The chance for the 10 teams who didn't make it through to the Furusiyya FEI Nations Cup™ qualifiers on Thursday to battle it out for the coveted Challenge Cup is back on! Up to 10cm of rain flooded the area on Friday, and the decision was made to cancel the event, as horse and rider safety takes precedence over anything else. Tomorrow morning, Sunday 25th from 11am CET, you can see it LIVE right here. Bookmark me and see you tomorrow! Spain will jump in Division 1 next season as they were placed 12th in yesterday’s first competition. Austria, which finished 13th in the first competition in Barcelona, will remain in Division 2 for the 2017 season. The Austrian and Spanish chefs d’equipe were informed of the decision by the FEI on Friday night. But today is the day of the ultimate test of the best of the best - the Final! 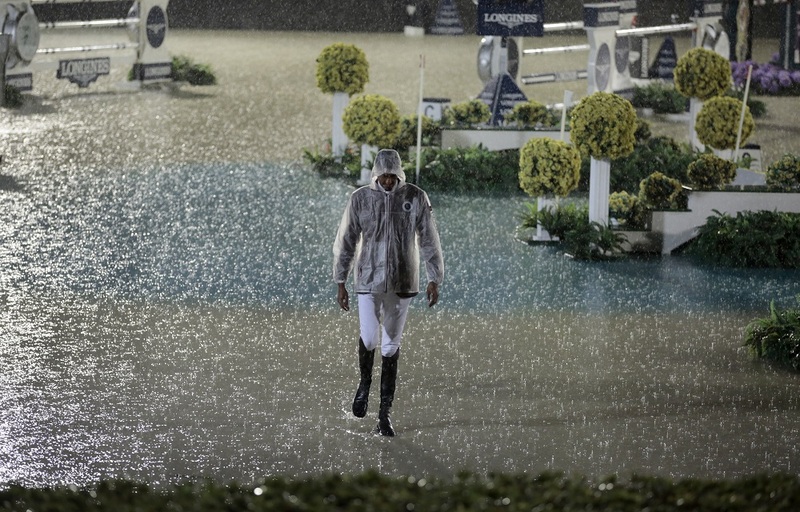 Once the arena has dried out, and barring any more downpours, the show will go on tonight, starting at 8:45pm CET. Check back in tomorrow to get the results, images and video of the event, and to watch live, click those big letters above. And remember, tag your posts with #SupportYourNation to win some cool prizes from Ariat and Longines!